Wednesday - Saturday: 10 a.m.-5:30 p.m. The Used Desk may be closed due to illness. Please call to check before making a special trip with books to trade in - 509-838-0206. Auntie's is pleased to offer used books as well as new. We receive used books from customers daily (see below for tips on this program) and each section in the store contains some popular used titles, so plan to spend a little time browsing. We also have a few bargain tables where we sell books for next to nothing, which is lucky for you, since you reap the benefits of hours of entertainment for a small portion of the original price. To check on the availability of a used book, please call us at 509-838-0206. Our used inventory is not presently available on-line. We are sorry for any inconvenience and appreciate your support! Whether you want to trade in a few of your older titles, check for that special out-of-print book you're trying to find, or just want to browse our shelves for bargains, you'll enjoy our used book services. Can't find it? Ask for an out-of-print search. Yes - we even do the searching for you! If you are bringing books down to the store to trade in we request that you bring ONLY 2 bags or boxes at a time. 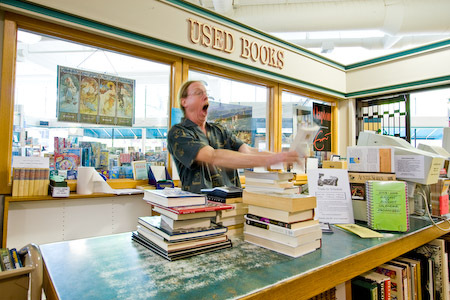 Our knowledgeable used book buyers will look at your books and take any that they think we can sell. They will generally give you store credit in the amount of 20% of the original price for paperbacks and the percentage of credit for hardcovers will vary. Our used book buyers will also appraise rare or collectible books for $3.00 per title. Please call and ask for Scott before you come down to the store, to ensure that he is available. Please call if you have any questions about the used book process or any other life and death matters relating to books.